Germany’s Jungheinrich AG has launched two RFID-enabled very narrow aisle (VNA) vertical order pickers. The EKS 210 and EKS 312, which vary somewhat in chassis size and speed and load-bearing abilities, deploy RFID technology to improve communication and assist in automating the inventory-picking process. Jungheinrich’s system uses an RFID-enabled warehouse navigation unit to transmit picking orders from the warehouse management system to the operator of the VNA vehicles. When the orders are accepted, the system automatically guides the vehicle to the proper location, using the shortest route and an optimal speed. Upon arrival at the correct spot, a lighting system indicates whether the product is located to the right or the left of the truck, increasing picking accuracy. 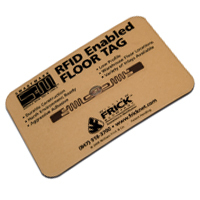 RFID transponders are inserted into the warehouse floor to guide the forklifts. Guidance offered by the transponders will instruct the truck to slow at corners or in case of rough floors. The system can also register height obstructions, preventing the truck lift from raising to high in an unsafe situation. Jungheinrich’s testing of the system indicates that the various features can add up to boost productivity by as much as 25 percent.